What to do with leftover sourdough starter? Starting the year with healthy and nutritious bread is a great way to improve your diet. In the same vein, minimising food waste should be another goal high on the list of food-related ambitions. 22.4% of all bread (equating to 660,000t or £640 million of bread) is thrown away in UK homes every year. Bread is in the top three foods that Britons are throwing away uneaten, with potatoes and milk also making the shameful top three. 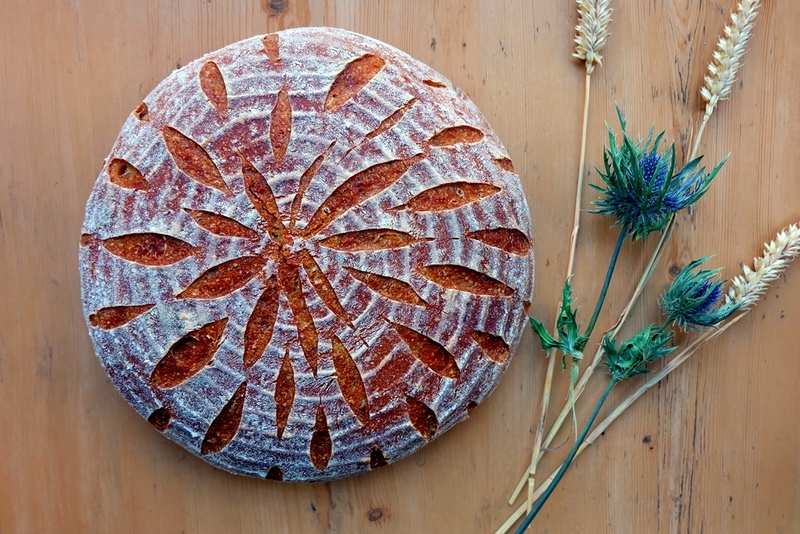 Here are some tips to reduce bread waste, from storing bread in an ideal environment to using stale pieces of bread and ideas for leftover sourdough starter. Use a bread bin for storing bread to allow it to breathe and stay moist while shielding it from the worst of the dry air. Storing bread in plastic doesn’t let moisture escape so iwill get mushy. You can counteract this somewhat by wrapping the bread in a clean kitchen towel before putting it in a plastic bag as the fabric will absorb moisture. Don’t store bread in the fridge as it goes stale much faster. However, the freezer is a good option to go for if you’d like to keep your bread fresh for more than a few days. I’m proud to report that I waste 0% of the bread I bake. Yes, we eat a lot of the tasty home-baked breads as long as they are fresh but, once a little bit stale, a splash of water and a hot oven can revive most breads to a deliciously soft state. Even really stale bread can be turned into breadcrumbs, croutons or pangrattato, used in salads such as fattoush or turned into bread dumplings or bread and butter pudding. There’s an assumption that stale bread means that it’s fit for the bin. But in actual fact stale bread is a versatile ingredient and there are many delicious recipes stale bread can be used in. 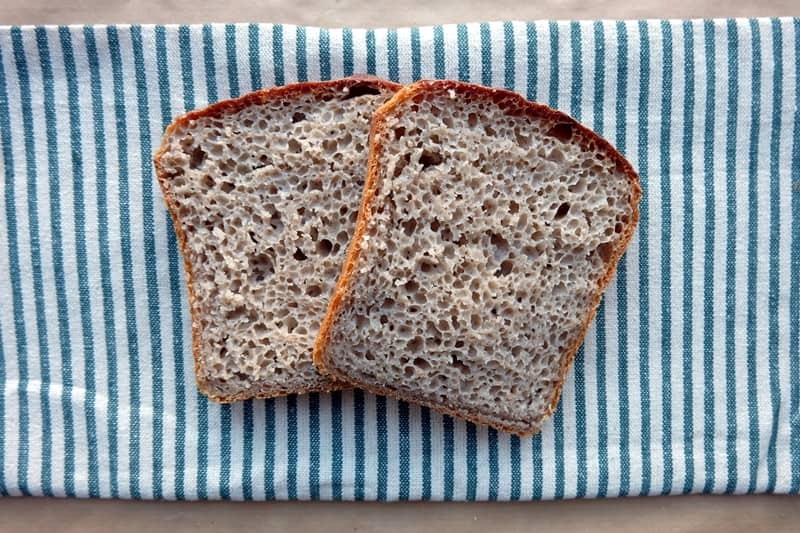 Another great way to use stale rye bread is adding some of it to your new bread dough. Old stale rye bread pieces add fantastic flavour to new loaves of bread. How to achieve this? You can either keep old pieces of dried out bread. When ready to bake, soak the stale bread in water and blend before using the ‘bread puree’ for new bread dough. Alternatively, if you have a grain mill at home, cut rye bread into cubes and leave them to dry out. Put them through the mill and let the crumbs dry out again. Just before baking, combine some of the crumbs with hot water which gives a wonderfully fragrant old bread soaker to add to your new dough. After this long preamble, what I’ve come to talk about specifically here is the topic of leftover sourdough starter. There are too many recipes which frustratingly encourage people to chuck leftover sourdough starter. Why should one toss a perfectly good portion of starter? Firstly, it’s perfectly possible to produce a sensible amount of starter to begin with, without having to discard mixture along the way. Secondly, there are many good ways to use any excess starter you might have, so don’t just put it in the bin. There’s never a reason to waste and discard accumulations of old but functioning sourdough. Here is one recipe that requires a good amount of sourdough starter (100g) and I’ve added another (new) recipe below using 140g starter. Please note: A fluffy loaf of sourdough bread is best baked with a refreshed, active starter to provide fermentation and leavening power. There are other recipes, however, that do well with discarded starter. Give the gift of good bread to your friends and family! A small amount (up to 10% of the total dough weight) of old starter will improve any bread in terms of flavour, especially yeast breads that don’t involve any sponge, sourdough or long fermentation. Just mix the old starter in with all the other ingredients and enjoy an improvement to the dough structure, flavour and quality that comes from its rich store of organic acids. 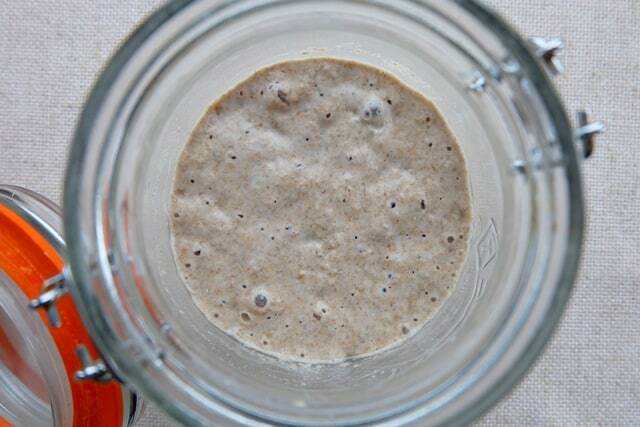 Use leftover sourdough starter to improve the flavour of pancakes, muffins or crackers . This is a new sourdough recipe I put together with the purpose of using some spare starter I had. Due to the large amount of sourdough starter used, it’s a very vigorous dough so will prove more quickly than other recipes using only a fraction of the starter. Combine the sourdough starter, rye flour and water in a medium bowl, cover and leave to rest at room temperature for about 16 hours until ripe and bubbly. An hour before you start making the dough, take a small bowl to soak the piece of stale rye bread in water. Make sure all of the old bread is covered. Leave to soak. Drain all the water from the bowl, then puree the bread until completely lump free. In a large bowl, combine the sourdough mixture from day 1 (all of it) with the main dough ingredients, including the pureed old bread. Form a dough and knead for a good 10 minutes. The dough will be quite soft, so you may want to knead it in a stand mixer. Place back in the bowl if you had taken the dough out onto your work surface and cover. Rest for about an hour at room temperature. You should see a good rise from the bread in that time. Oil a large bread baking tin and fill the punched down dough into the form. Dust with flour, cover with a polythene bag and prove for a few hours at room temperature until fully proved (e.g. if it filled your tin by half, it should now come almost to the top). Preheat your oven to 230°C in time for baking, then bake for 10 minutes at 230°C and a further 40 minutes at 190°C.